A revolution in ultra-compact device design, this new Intel® NUC packs more features, including support for 2.5-inch drives, into an innovative small form factor. 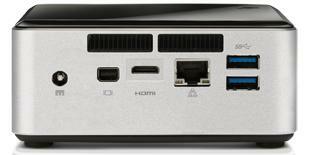 This fully scalable, computing solution comes complete with the latest 4th generation Intel® Core™ i3 processor. 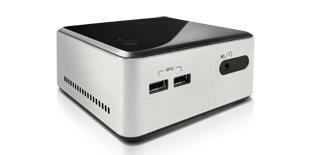 The Intel NUC provides a flexible, customizable engine to drive home theater PCs, media server PCs, and intelligent computing for small spaces, or anywhere else you can imagine. 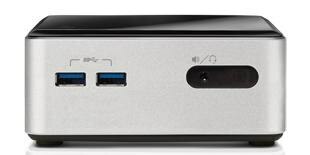 The D34010WYKH SKU of Intel NUC has many useful features including four USB 3.0 ports, an infrared sensor, a headphone/microphone jack, Mini HDMI*, and Mini DisplayPort* video interfaces, and extra space to accommodate 2.5-inch HDD or SSD drives to support a variety of home or small office usages. The D34010WYKH is equipped with the 4th generation Intel® Core™ i3-4010U processor featuring visibly smart graphics using Intel® HD Graphics 4400 to provide amazing performance and visually stunning graphics. Warranty Terms Intel offers three-year limited warranties on Intel® NUC products purchased from Intel authorized distributors. This warranty covers all hardware items included in the box. 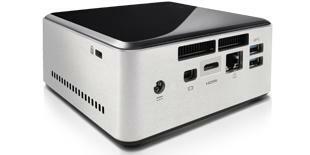 To Recieve updates and possible rewards for Intel Intel® NUC Kit D34010WYKH please sign in. To Recieve updates and possible rewards for Desktop & Mini PC please sign in.